In the automobile and their supplier industry, high quantities of uniform workpieces have to be inspected, partially piece for piece, under a high cost pressure. The cost pressure has not only influence on the used testing technique, but also on the required throughput-rate. In non destructive testing, crack detection plays an important role. For testing high quantities of specimens with simple geometry like rods, tubes or bolts, the ultrasound- or eddy current technique are preferably used. For ferromagnetic specimens with complicated geometry magnetic particle inspection (MPI), however is the most suitable technique. Based on practical examples, several MPI techniques with various handling procedures are shown in order to minimise the testing cycle. Current state of the art to inspect for cracks in all directions during one cycle, is not specially discussed in this lecture. It is only mentioned, that this is achieved by applying a combination of two phase shifted alternating magnetic fields, which are perpendicular orientated to each other. The procedure of MP-crack detection consists of several steps: the transportation of the specimens, the testing process in order to generate the crack indications and finally the visual evaluation. For an inspection system with a comparably low level of automation, the operator manually places the specimen into the machine and the inspection process is started by activating a food-or hand-switch. Figure 1 shows such a standard machine with 2 contacts. The inspection process has a fixed time frame and it runs automatically. This process includes the clamping (approx. 0,5 sec) of the specimen, the magnetizing and the spraying of the inspection medium (approx. 4 sec), the re-magnetizing (approx. 1,5 sec), the demagnetization (approx. 1,5 sec.) and the release (approx. 0,5 sec) of the clamping device. Afterwards, the operator removes the specimen and makes the visual evaluation by using ultraviolet light in order to check, if crack indications have appeared or not. Workpieces without indications are put e.g. into a skeleton container. In this case, the automation is given by the automated time frame of the inspection process. Including demagnetization, the inspection process requires approximately 8 seconds. Additionally, the time for loading and unloading of the specimen and the time required for the visual evaluation have to be considered. With such a system, you cannot expect to achieve a high throughput-rate. Workpieces with a complex shape like steering knuckles, have to be clamped several times in such a machine, if it is required to check the entire surface of the specimen. This is an extremely time-consuming procedure. The achievable degree of automation (maximum reduction of the cycle time) depends on many influences/conditions e.g. : weight, size and geometry of the workpiece. Also the required scope of inspection, the consideration of additional inspection techniques, the quantity of available operators and also the given local preconditions define the extent of the highest possible automation level. by using special inspection concepts like machines with more than 2 magnetizing circuits or by using a permanent test cycle (that means: the time gap between two cycles is controlled by the machine pre-set) or by performing the demagnetization outside the machine. Transport devices for loading and unloading with the specimens. In the following, we will discuss some possibilities based on some practical examples. The demagnetization performed inside the machine during the testing process requires about 1,5 seconds. For the procedure described above, this is about 19 % of the time needed for the entire testing process. The conclusion: An external demagnetization (that means outside the machine) reduces the cycle time considerably. With external demagnetization, the next workpiece can already be tested in the machine. The external demagnetization is mostly performed by moving the specimen through a separate coil, fed by AC-current. The workpiece can be moved through the coil on a conveyor belt, or the specimen slides through an inclined adjusted coil. Figure 2 shows such a typical demagnetization coil. However for the inspection of big or bulky pieces the operators very often use handling systems in order to take these specimens into and out of the machine again. In these cases, the demagnetization inside the machine is preferable, as it is less time consuming as the external one. When it is required to demagnetize the specimen after the visual inspection, the automated testing cycle does not include the demagnetization. In this case, the visual evaluation is performed inside the machine and afterwards the demagnetization is activated by pressing a respective key on the operator panel of the machine. In general, high through-put rates should not affect the inspection safety. Depending on the inspection result (clear or doubtful), the required time for the visual evaluation process can be short or sometimes quite long. It is therefore critical to integrate the visual inspection process into the fixed inspection cycle. This is realised by building a buffer in front of the visual evaluation station. Experience has shown during many years, that the use of slowly moving turn tables with one or several inspectors are favourable for the visual evaluation. If specimens with complicated geometry such as steering knuckles, have to be inspected in a standard machine with two contacts, the test procedure would be very time consuming. In order to find cracks in all directions on the whole surface, the specimen has to be clamped for several times, each time between respective other ends of the specimen and after each magnetizing process you have to make the respective visual evaluation. Besides the considerable inspection time, the crack identification deteriorates from one visual inspection to the next as the fluorescent background on the specimen becomes stronger and stronger. In order to have the capability to inspect those workpieces during an acceptable time with MPI, special machines with more than 2 contacts have been developed. Figure 3 shows a steering knuckle positioned in a workpiece holder. 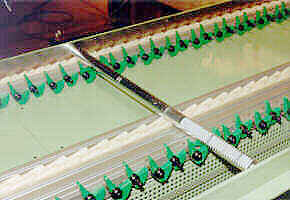 The 3 laminated horizontal yokes conduct the field flow and also 3 independently adjustable currents into the specimen. Additionally, two independent adjustable currents are fed into the workpiece via two vertical contacts coming from the top. Each of the 5 current circuits are defined by adjusting a connector device. With such a 5-contact-machine, the entire surface of workpieces with complicated geometry, such as steering knuckles, can be inspected for cracks in all directions in one shot. During the clamping process, each of the contacts can be pneumatically moved up to 100 mm until the workpiece is properly clamped by the contacts. In order to avoid the jumping of the specimen out of its position during the clamping process, the contact pressure of each contact and its initial position are adjustable. Also time delays to coordinate the clamping, can be chosen. In order to test specimens with simple geometry, this versatile machine is also applicable. It has only to switch off the two vertical currents and one of the horizontal yokes on the left side. 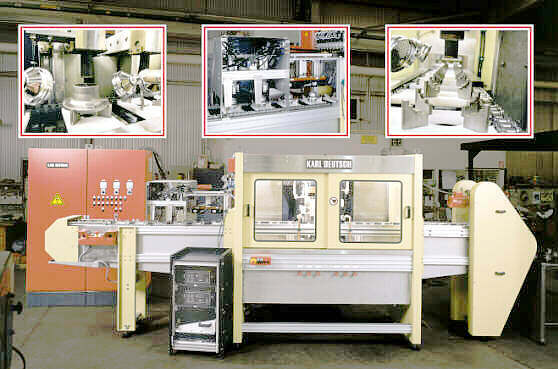 In this case, you will have a machine with features like a standard 2 contact machine. A very simple but also a very effective system for the reduction of the cycle time is the application of workpiece ejectors. Figure 4 shows a machine with 3 contacts and a workpiece ejector suitable for transverse links. 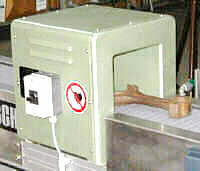 The operator loads the machine with the transverse link and activates the testing process by pressing the foot switch. After releasing the specimen, the workpiece ejector is pneumatically tilted backwards. The transverse link slides out of the machine down on a visual inspection table or a conveyor belt leading to the visual inspection station. Afterwards the specimen is demagnetized by moving it through a coil. During the inspection at least two operators are involved, one operates the machine, one or more operators are responsible for the visual evaluation. The ejector tilting and the movement back into its loading position is integrated in the automatic test cycle. The ejector principally consists of two parts. The pneumatically tiltable ejector ground plate and a special workpiece holder specially matched to the respective specimen. As it is possible to mount other holders for other workpieces very quickly on the ejector ground plate, this set-up is suitable for a wide range of different products. A 2 contact standard machine can be obtained by removal the ejector and by switching off one of the contacts on the left side. In order to meet the safety regulations, a two-hand-operation is often used. If this is rejected, light barriers or a light curtain can be built-in in front of the machine (see figure 3). Of course, the ejector can only be re-loaded with the next specimen, when the tilted ejector has been moved back to its loading position. The loading is integrated into the cycle, with other words, the ejectors can not be loaded while the testing is performed. Machines equipped with an ejector offer for workpieces with complex geometry (e.g. steering knuckles, transverse links or pistons) a through-put of 8 seconds per specimen. As the operator does not need to take the workpiece out of the machine during the testing procedure, he is able to take the next workpiece and perform other tasks. Examples are a visual evaluation in order to find geometry defects, an eddy current testing to check the structure, or straighten the workpiece in a press. The chain conveyor enables the loading with specimens independent (or dependent) of the testing cycle, which means that during the testing process the workpiece holders of the conveyor can be loaded. 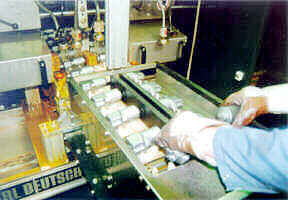 Figure 5 shows a chain conveyor, which is mounted to a standard machine. Here, fuel injection pump housings are inspected for cracks in all directions on the entire surface. The small size of these parts enables to test 2 pieces during one test cycle. During the clamping, both outer contacts can be pneumatically moved up to 100 mm. Two specimens are pressed against an additional middle contact. Thus, the current flows from one specimen through the additional contact to the other specimen. Besides the current flow, also the field flow is lead into both workpieces, following the same path. In general, up to three specimens arranged in a row can be checked in one test cycle depending on the geometry. In that case, special movable contacts between the specimens have to be provided. 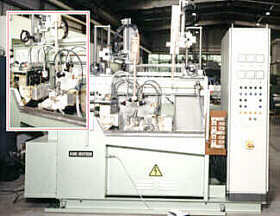 In order to increase the through-put, the machine can be switched over to the permanent cycle. Thus, no unnecessary intermittences will occur and the time parameters of the machine entered into the electrical control, determine the through-put. After the declamping, the next workpiece holder filled with two specimens automatically moves to the magnetizing station while two already tested specimens slide on a visual inspection table. The demagnetizing is performed by putting them on a conveyor belt which moves first through a demagnetizing coil. Afterwards this conveyor leads through a second coil in order to test its structure with eddy current. The chain conveyor contains a lot of identical workpiece holders. After the operator has loaded several holders he can perform other tasks for a short time, e.g. to lay out skeleton containers with oil papers. When most of the holders are empty, the operator has to load them again in order to avoid that the testing is interrupted. Comparable to the use of a workpiece ejector, the use of a chain conveyor reduces the cycle time by further 2 seconds. Typically, one operator loads the machine and two others are involved in the visual inspection process. 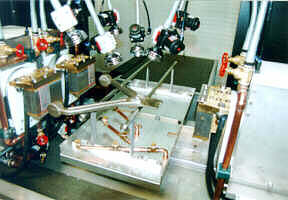 The cycle time is 6 seconds for one specimen in the special case of testing the fuel injection pump housings. From the machine side, a test cycle of 3-4 seconds is possible. When the workpiece geometry changes, the chain conveyor can be equipped with new guidances. It is also possible to remove the entire chain conveyor. Again, a standard machine with a standard control is obtained. As the length of the conveyor belt is usually limited for economical reasons, the number of loaded specimens is also limited. To further automate the entire loading process and to give the operator more time to do other tasks, a specimen buffer with a transfer station can be used. The operator manually places high numbers of specimens into the buffer. The transfer station loads them into the conveyor belt without operator assistance. Manufacturers with a relative large variety of specimen types, as for example forges, have naturally no conveyor belts which are equipped with special workpiece guidances, as the variety of the workpieces is very large. Therefore, the test pieces are transported for example in skeleton containers to the test machine which usually requires an operator to load the machine. In product lines, in which always the same product is produced over many years, in most cases conveyors with special workpiece holders are used. In this case, the degree of automation of the magnetic particle crack detection process can be further improved by linking the chain conveyor or the workpiece ejector with the production line. They are automatically loaded by a suitable transfer station such as a robot or a system consisting of a combination of a separator and a stopper. It is also possible to design a special machine around an already existing transport system. Is a MPI machine linked to a production line, its cycle time determines the cycle time of the chain conveyer or the workpiece ejector. In order to provide sufficient time for the visual inspection process, a sufficient quantity of operators for the visual evaluation and a transport system which transports the good and bad workpieces out of the viewing area must be available. Such a linked machine operates in a permanent cycle, the operators always have be able to interrupt the test cycle. The actual cycle is always finished before the machine is stopped. If other previous machines can not be stopped, a buffer must be integrated into the line. Sometimes the usage of a buffer is necessary due to other reasons. For example during the production of steering racks, the specimens leave a previous polishing machine without any constant cycle. 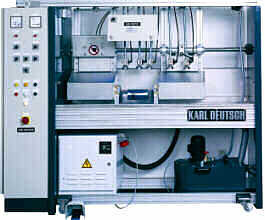 In order to load the crack MPI machine with a constant cycle, a buffer is inserted between both machines. Figure 6 shows such a buffer, a transfer station combines the buffer with a chain conveyor. In the examples given up to now, we have basically used standard machines, which were modified in order to provide test cycles as short as possible. After removing the modifications, standard machines are obtained. An adjustment for different specimens is then easyly possible. In figure 7 a special machine for detecting cracks in wheel hubs with outer diameters from approximately 80 mm to 160 mm is shown. 2 wheel hubs are tested in one cycle. A double gripper loads the machine which operates in a permanent cycle. The magnetizing station consists of 2 vertical positioned magnetizing bars, which are pneumatically moved through the wheel hub during the testing process. Each of the two operators - both performing the visual evaluation - can interrupt the permanent cycle by pressing a key. After the current cycle is finished, the entire machine, stops. In this machine, two additional testing techniques are applied before the magnetic crack detection is performed. First, a testing of geometry and afterwards a testing of the structure. Therefore, 3 different testing techniques are involved in one test cycle resulting in a cycle time for one wheel hub of 5 seconds. The wheel hubs directly slide on the visual evaluation table. After visual evaluation they are demagnetized by sliding through an inclined coil. In this case the additional geometry- and structure inspection determine the arrangement and the designe of the workpiece holders. Only a special machine, suitable only for this application, would solve this complicated inspection task. A modification of a standard machine was not applicable. The spraying is performed by a spraying device, which is mounted to the coil. The coil velocity is about 100 mm/sec and can be increased up to 300 mm/sec. A conveyor belt with workpiece holders transports the crank shafts to a linking station. There, a robot takes the crank shaft and puts it into the machine. The demagnetization is directly performed after the re-magnetization inside the machine. Afterwards, a second robot takes it out (figure 8) and puts it into a workpiece holder, which is mounted to a turn table. A second workpiece holder is mounted at the other end of this table. The viewing area and the operator are lockated at the back side of the turn table (not visible in Fig. 8). Two visual evaluation stations are presented, each equipped with such table like described above to increase the through-put. 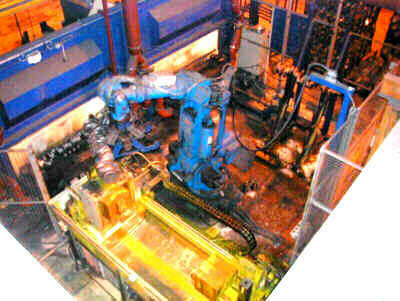 If the workpiece holders on the both tables are occupied, the robot automatically position the tested crank shafts into a buffer. The achievable cycle time is determined by the time required for the visual evaluation which is about 30 seconds. This relatively short cycle time would not be possible without robots. In order to minimise the cycle time and to reduce the labour cost, the automation of the entire evaluation process is of large interest. Systems with automated evaluation have been presented in the past. The idea is to capture the specimen surface with cameras which produce a digital image of the specimen surface. Digital image processing is used to automatically judge about surface indications. An algorithm is implemented which imposes conditions on the crack geometry. The edges of the specimen always lead to crack-like indications because the magnetic field is disturbed at those locations. Therefore, such indications have to be suppressed in the flaw evaluation. The automated inspection is very sensitive to the overall contrast of the digitised image. The test conditions such as the background illumination and the properties of the magnetic particle agent have to be well controlled. Two FLUXAMAT systems were delivered to two well-known automotive companies in Germany. It has been proven that the systems were more reliable than the human inspector. This was true not only for the detection of various flaw types but also for the percentage of pseudo-indications. Especially for high through-put rates, the automated system becomes more economical. On the other hand, the operator personnel for a conventional system does not need high qualification. For an automated system, at least one operator needs good background knowledge about the inspection method and the operation of the system. The future will show, if the automated evaluation has a future.